The Kogod School of Business at American University announces the opening of the AU Center for Innovation in the Capital with a launch event featuring remarks by Deputy Mayor Courtney R. Snowden. 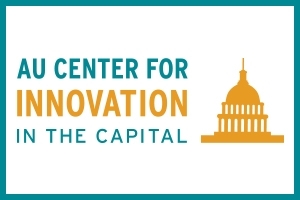 The new Center will provide innovation and entrepreneurship training, application and research in order to tool and energize a new generation of leaders both inside and beyond the greater Washington region. Focused on developing vibrant generators of social impact, asset development and wealth creation, the Center for Innovation will train and develop stakeholders to become leaders in industry and in their communities. The Center will also provide access to social, intellectual and financial capital for its stakeholders both on campus and beyond. Forthcoming programs include: innovation speaker series, citywide hackathons, research partnerships, business plan competitions, etc. Additionally, Cartified, a former AU Incubator business team lead by Vladimir Kartashov, a full-time Kogod MBA student, will receive a $15,000 investment from the Eagle Entrepreneurs’ Fund. Cartified’s mission is to improve the used car industry by making the process of buying and selling used cars easy and hassle-free. The Eagle Entrepreneurs’ Fund is a valuable AU Center for Innovation in the Capital program that provides a source of cash infusion to accepted student/alumni ventures. The goal of the Fund is to provide AU business teams the opportunity to apply for modest, early stage seed funding in order to support critical activities such as building out a Proof of Concept, prototype development/refinement, beta testing of the product/service, obtaining customer feedback to assist in product/service improvements, and/or other appropriate early stage activities.